After last year's fantastic meal here (see earlier review: Osteria Francescana), we decided that we had to make a special detour this time round to try this again. 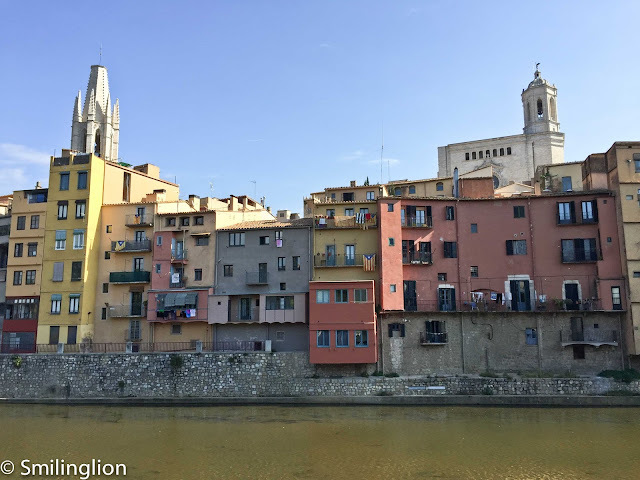 We were traveling from Florence and it was a 2.5 hour car ride north-west to Modena (we were supposed to go to Venice after and that's a 3 hour drive north-east). Unlike the last trip (when we were staying in Bologna which was a 2 hour drive away), we decided to stay near to the restaurant so that we didn't have to worry about driving back too far after a long and heavy meal. 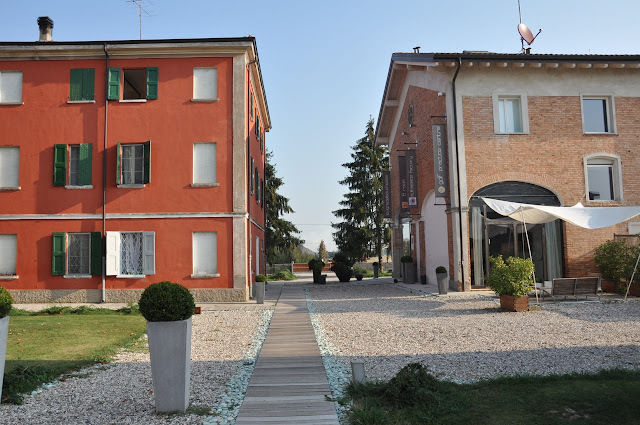 So we found a delightful B&B just 20 minutes drive from the Modena city centre (see writeup on it below). Expectations were sky-high this time, as can be expected after last year's visit, and also because in the meantime, the restaurant climbed to a high of fourth place in the San Pelligrino Top 50 Best Restaurants in the World list and won the prestigious Chef's Choice award. 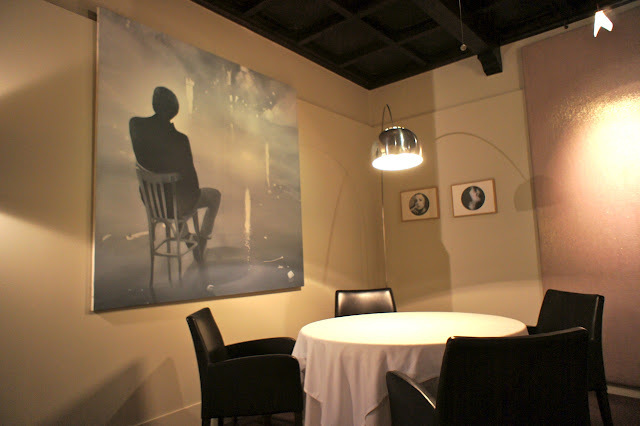 To our surprise, when we got there, we were warmly welcomed at the door by what seemed like the entire service staff and the chef himself, Chef Massimo Bottura. It would not have been totally unexpected for them to be more stuffy and arrogant after the increasing international recognition the chef and his restaurant have been getting in the past year, but to the contrary, it seemed like they were trying even harder as a result. Kudos to them for that. The restaurant was full that night, though it never felt crowded because the dining room only had 6 tables when it could easy fit 50% more, and 5 of those tables, though capable of fitting 4 persons, only had 2 guests per table. This time, Chef Massimo himself came out to take our food orders. 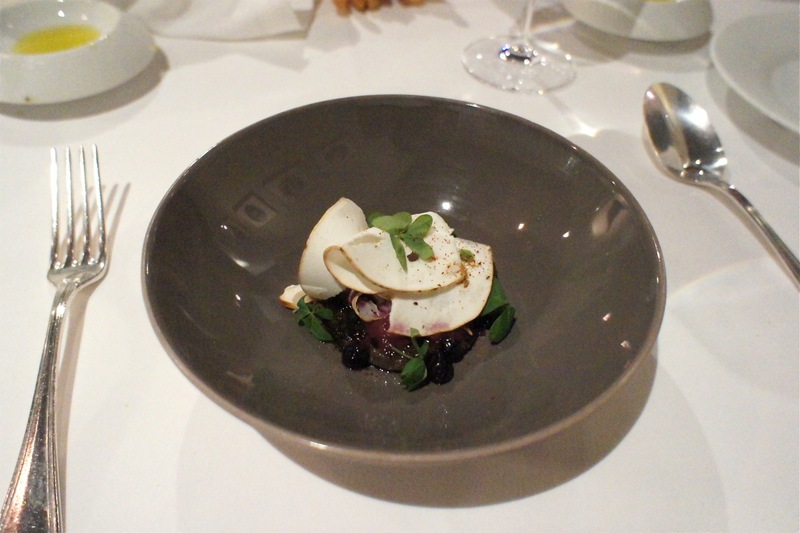 We had the traditional menu the last time, so we went for the 'Sensations' menu which was the chef's newest creations. Chef Massimo appeared particularly motivated this time and was keen for us to try some of his new dishes. We had some champagne and picked out a 1997 Guada al Tasso from Antinori which was a superlative wine from a spectacular vintage. The sommelier seemed suitable impressed. 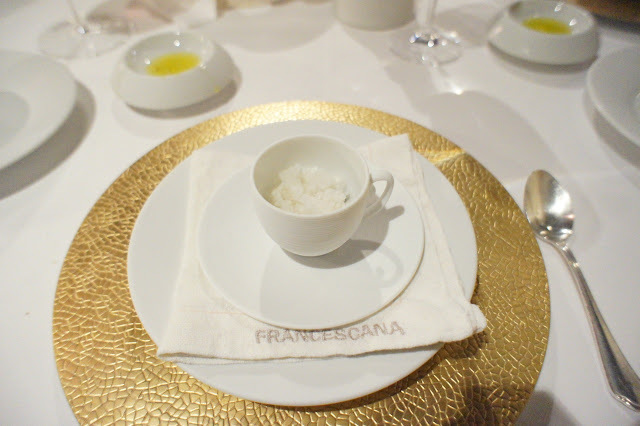 Almond granita, capers and cream of coffee - We started with this amuse bouche which was refreshing yet full of complementary flavours. 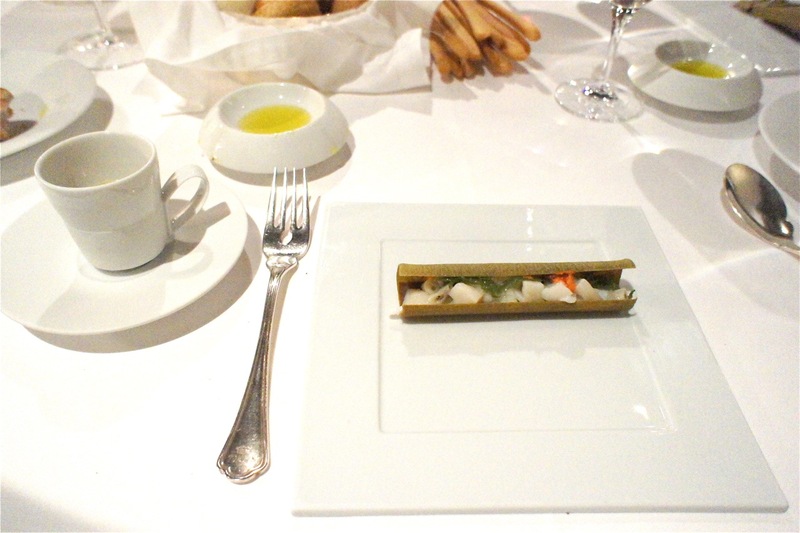 Razor clams with seaweed shell and clam consommé - This was an excellent dish. Lots of razor clam meat wrapped in crispy Japanese seaweed created to look like a razor clam shell. The consommé was also very rich and delicious. Cod fish - This was a bit of a let-down. The fish was cooked perfectly but somehow we felt that the clear sauce was too sour and acidic and that overpowered the overall taste of the dish. 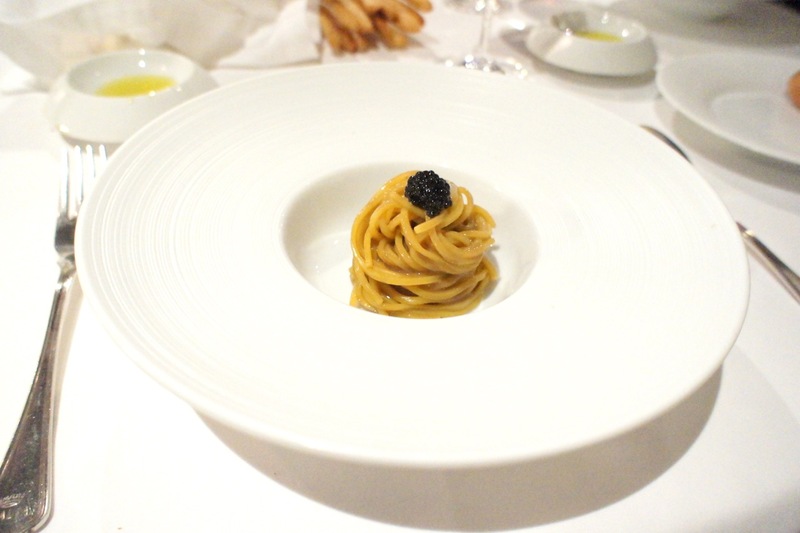 Flat pasta with caviar - This was also very good. The pasta tasted very much like Japanese soba but had an al dente bite to it. It was cooked with just some oil and minimal condiments, allowing the flavour of the pasta itself to come out quite strongly. The caviar was a nice touch to add some kick to the dish. Sea bass with crispy skin and razor clam, rabbit and dried pork floss sauce - This was an innovative dish which was also superb. 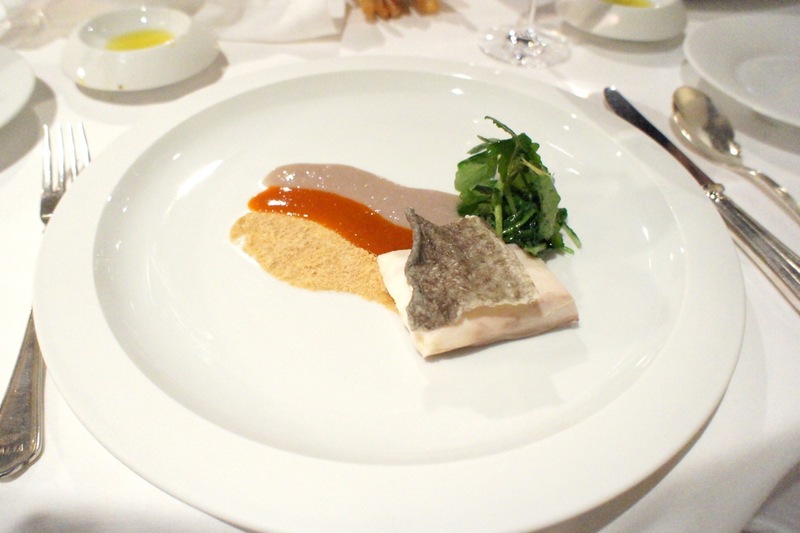 The 3 sauces worked well together with the perfectly cooked sea bass. 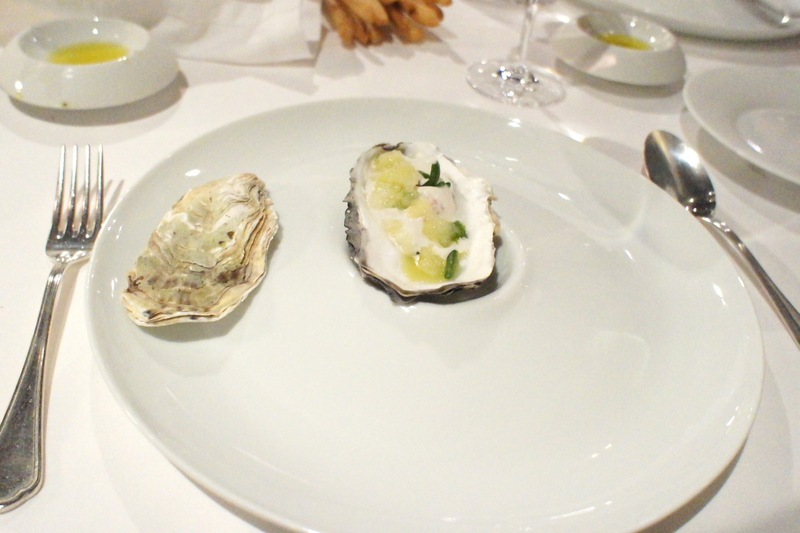 Deconstructed oyster - This was a white foam which tasted exactly like oyster with chopped lamb tartare to give the body (under the foam), and lemon pulp (to simulate the lemon juice usually squeezed on an oyster). Very molecular, very fresh and very good. 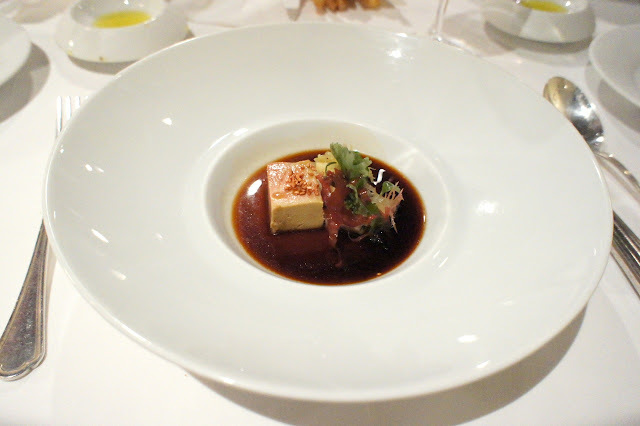 Foie gras in Japanese soya sauce - This was an average dish. 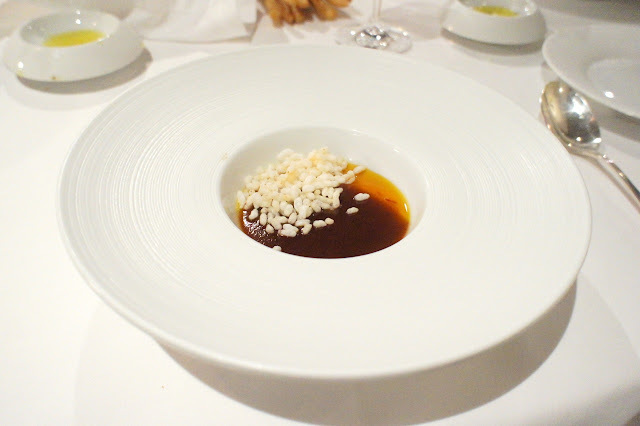 The foie gras was good enough, but the soya sauce didn't seem like a natural fit with the liver. 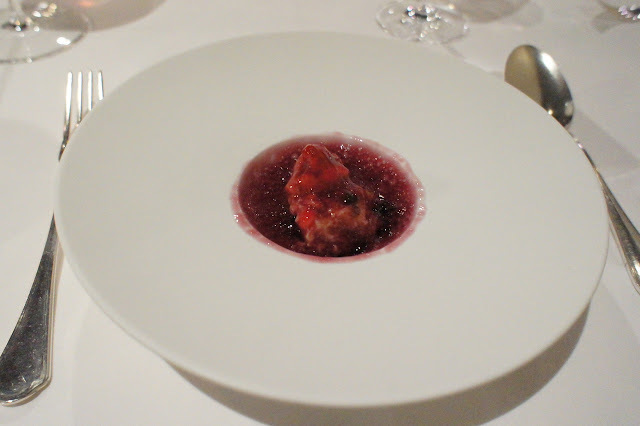 Ossobuco deconstructed - It was a thick gooey liquid which tasted exactly like ossobuco, with dried cripsy risotto on it. Another excellent dish. Lamb with mint - This was more traditionally prepared than many of the earlier dishes. 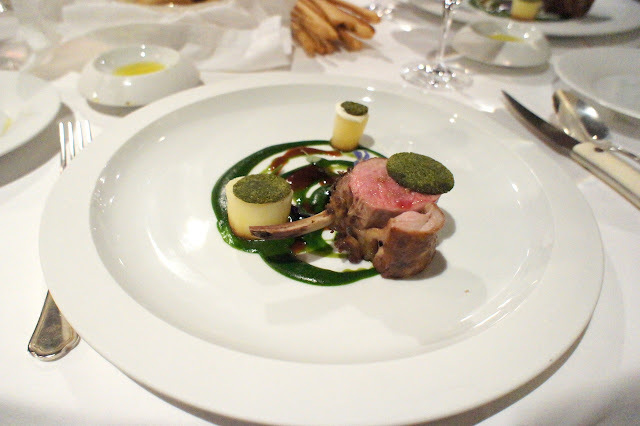 It was a perfectly cooked lamb rib accompanied by mint crackers and mint puree sauce. Cepes mushrooms with Italian meat marinade - This is another innovative dish whereby the mushrooms sit on a bed of gelatinous substance which tasted exactly like eating a well-marinated meat but without the meat. 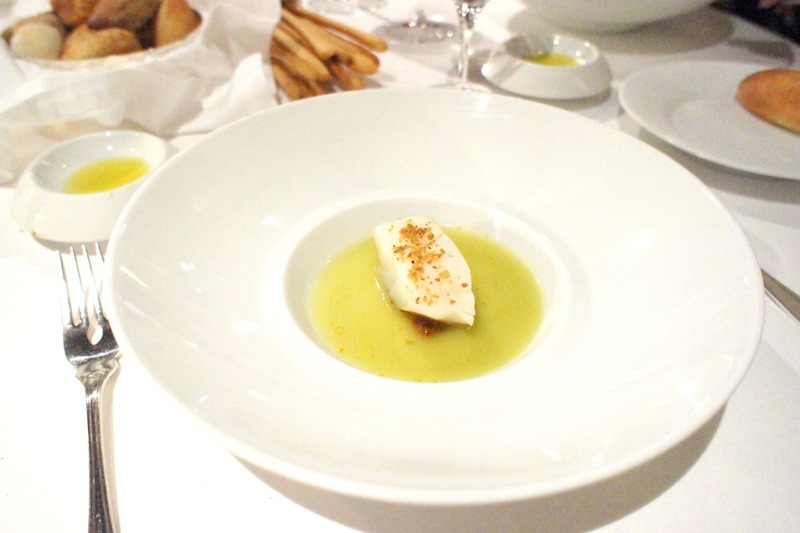 According to Chef Massimo, it was a new dish which he was still experimenting on. Sangria deconstructed - This was the pre-dessert. It was a solid substance which melted in our mouths and tasted like sangria. We don't like sangria, so though though it was somewhat refreshing, it wasn't that great. 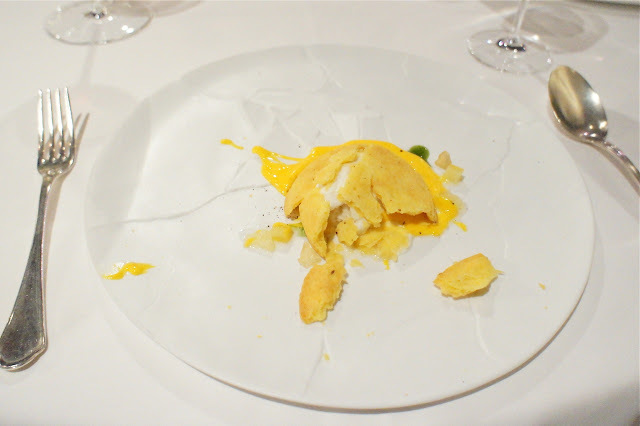 Broken lemon tart - This was a very interesting dessert. It was supposed to be a lemon tart after the plate has been dropped on the floor. They even used a plate which looked like it was cracked. Though visually provoking, it tasted like a normal (albeit good) lemon tart. 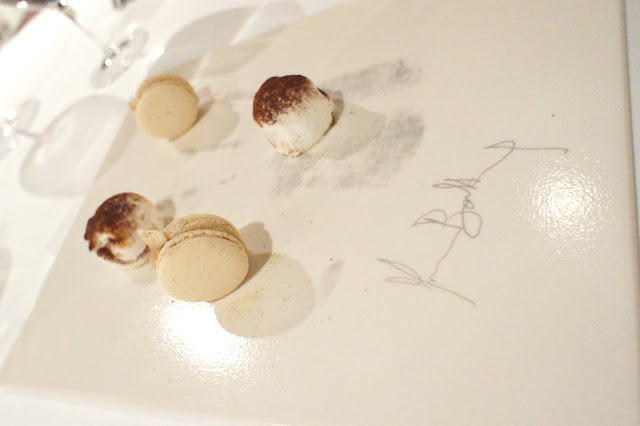 Foie gras macarons and foie gras marshmallow - It was the petit four which stood out at the end of the meal. Rich foie gras flavours infused into the pastries. It was another great and memorable meal. As the chef kept pushing out dishes after dishes (we noticed that the other tables, though ordering the same menu, had at least 2 dishes less than us - they didn't have the ossobuco and the meat marinade), keeping us there till everyone else had left. Given the level of attention from the chef and his staff this time round and the quality of the wine we had, I enjoyed this meal more so than the last one. As we left, he presented us with a parting gift of an in-house bottled Modena balsamic. Chef Massimo has achieved the level of cooking whereby he has struck the balance of being innovative (especially when molecular gastronomy is such an international craze now) yet still staying grounded in his roots. Having spoken to him on this visit as well as the last, the impression we get was that it is very important to him to maintain his culinary roots in the traditions of Emilia-Romagna, hence of his many dishes, certain of his dishes still remind us of the food in this region (e.g. the rabbit and pork floss sauce for the sea bass, the ossobuco and the lamb with mint). Molecular gastronomy can sometimes be for the sake of it, resulting in pointless food creations which do nothing more than to illustrate how clever the chef is. But for Chef Massimo, he ensures that his menus have a mix of the new and the old, and doesn't get too carried away with foams, mists and infusions. 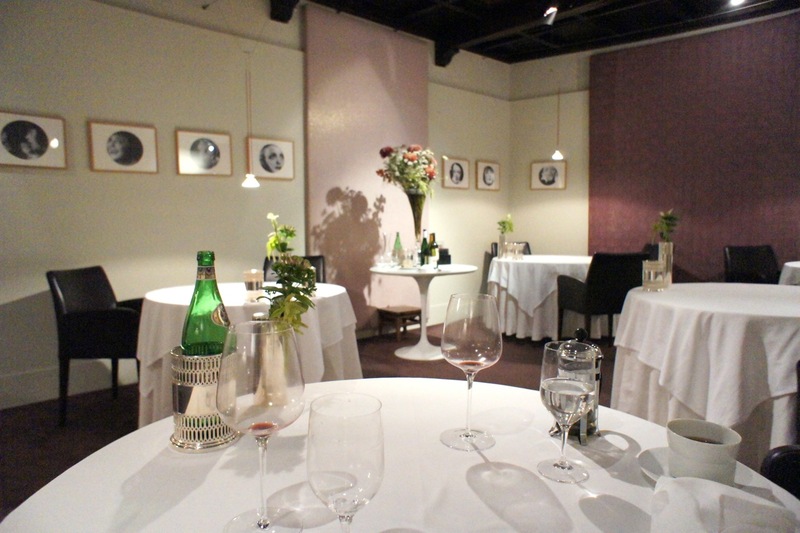 Final Thoughts: It is the finest restaurant in Italy which we have dined in, without doubt. Chef Massimo continues to innovate and his desire to discover new ideas makes eating there a unique experience whereby the cooking is a performance art and not simply to put food on the table to feed the diners. The enthusiasm of Chef Massimo filters down to his entire staff and you'd get professional attention with genuine warmth here. During this trip to Modena for the day (to eat at Osteria Francescana), we found a gem of a place to stay. It is a converted farmhouse 20 minutes drive from the city centre in a small hamlet called Soliera. Le Vigne della Duchessa Country Resort (http://www.levignedelladuchessa.it/) is a bed and breakfast located in a newly renovated barn next to an older 3-story house occupied by the property's owners. 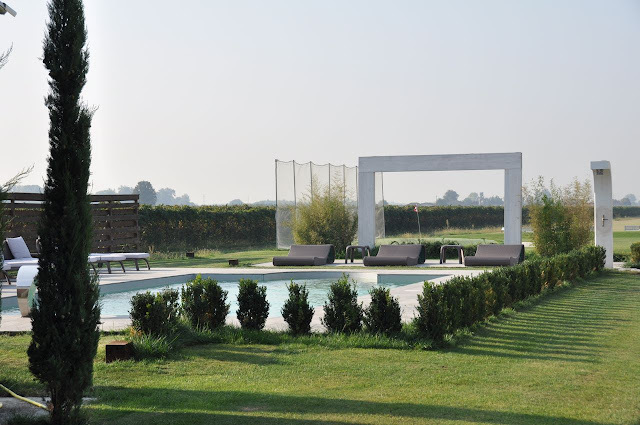 This property is situated in the middle of a vast farmland, on which are pear plantations and vineyards (owned by the family who runs this resort). The resort has all the modern amenities like wifi, air conditioning, cable tv etc and the rooms are nicely decorated in the modern style. There's also a large swimming pool outside and interestingly, a golf driving range as well (it seems they take their golf here very seriously). Despite the modernity of this place, the family treated us with the old-style Italian hospitality. 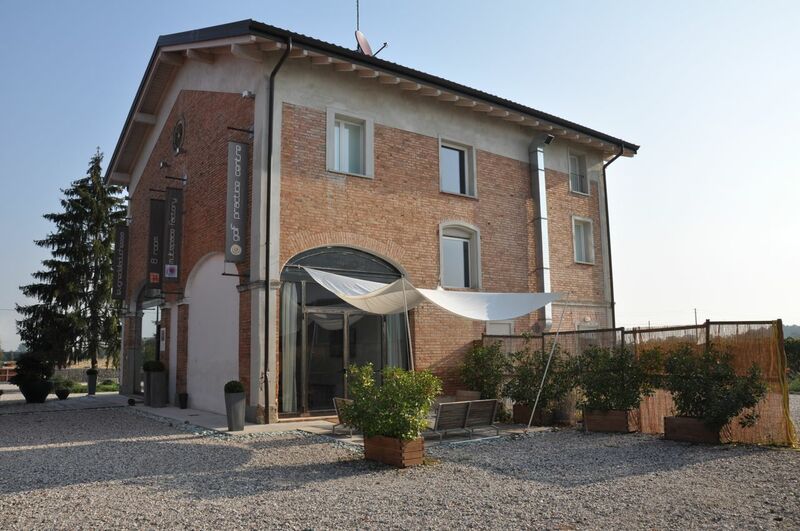 Room rates were very reasonable and it's a great stopover if eating in Modena (if you don't want to stay in the city centre) or even if driving from Florence or Bologna northwards to Milan or westwards to Piedmont.